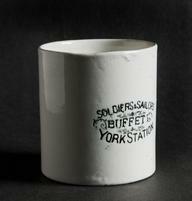 Mug, ceramic, Rail Express Systems, white, depicting Royal Mail Travelling Post Office. Printed. Overall: 94 mm x 110 mm 80 mm.